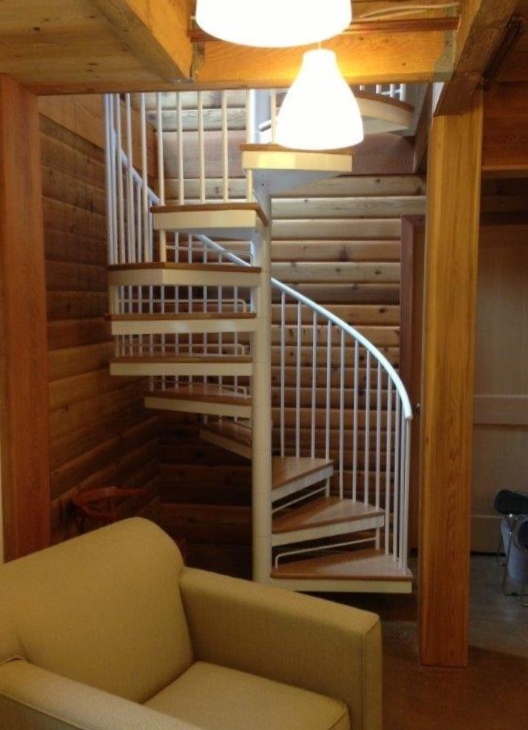 Stairways Inc. manufactures residential spiral stairs which can be used for interior or exterior use. There are various applications for these residential spiral staircases including the ones below and many more! 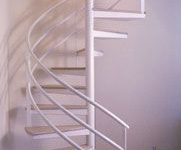 Stairways Inc. offers four spiral stair models. Ranging from all welded to bolted. Including Steel, wood, aluminum, stainless steel and combinations of all. See stair types listed below for information and ideas to help you make your stair type choice. 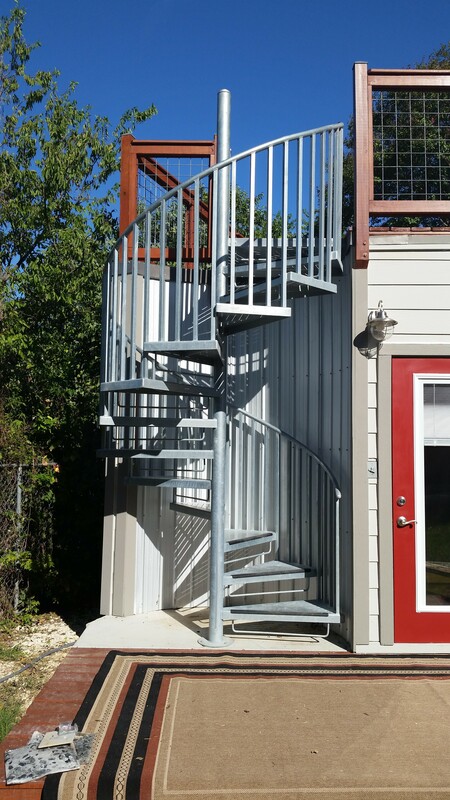 Fully Assembled Spiral Steel - Fully Assembled spiral stairs are welded and ship in one or two sections and have the most options to offer. 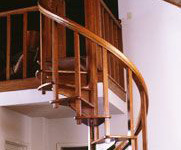 Any of the components seen on pages 13, 14 & 15, in our catalog, are available on this type of spiral staircase. Perfect for residential applications. Available in steel, aluminum and stainless steel. The advantages of welded construction are: Design adaptability, any diameter and height, and any material. Ability to ship up to ten code-compliant stairs, per truck, when purchasing in quantity. Interior All welded spiral stairs have countless options combining different steps balusters and handrails. These options can change the appearance of your stair. Wood and metal combinations work well in traditional settings. Finishes All welded spiral staircases have wide range of material and finishes. Steel, can be shipped bare if you want to apply your own finish. Most steel stairs ship with a primed finish. Primed finish can be used as a final coat or a colored coating can be applied over the primer. We offer a primer and enamel finish. Black enamel being the most economical, you can choose as a top coat any color Sherwin Williams offers. On all welded spiral stairways the stair can be galvanized. An excellent coating for exterior use more so in coastal applications. We also offer polyurethane or epoxy coatings if high performance is necessary. Standard Spiral Kit - This is our most common spiral stair. It is a bolted assembly with stamped parts. The cost is comparable to a Fully Assembled welded spiral staircase. It is economical to produce and ship. There are limited options, but there are still a good variety of step baluster and handrail designs to choose from. Standard spiral stair kits are available in diameters from 40" to 72" with no height limitation. Available materials for this type of staircase are steel, aluminum, and stainless steel. Assembly of a Standard Spiral Kit stair requires two people and approximately 8 hours to complete and it is the most economical to ship. Interior Applications - Main advantage for choosing a bolt together spiral staircase for indoor applications is ease of entry. Bolt together or kit spiral staircases are shipped knocked down. Generally shipped in a 48" x 36" x 24" box, they can be taken down hallways or around corners. Standard bolt together spiral stairs have many options for inside use. Wood step, landing and handrail options are available. All plasma cut step and landing designs are available. Balusters can be a simple square or round, also available are many collar, ornamental shapes and casting designs. 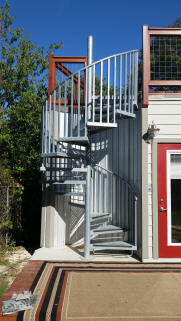 Exterior Applications - Spiral stair standard kits can be a fine stair choice if the right choices have been made. Spiral stair kits by design have many pieces that overlap each other. These areas will collect water and are hard to paint once installed. If your application is on the coast at a minimum galvanize or use aluminum. In areas that are not in moist atmospheres prime and paint. Exterior spiral staircase kits can be used in a single floor or multiple floor condition. All options for step, baluster and handrail options are available, do not use wood exterior. Heavy Duty Spiral Kit - This is a bolted assembly with all machined parts. Heavy Duty does not mean that it is more structurally sound than our other types of spiral stairs; it only refers to the manufacturing procedures. Heavy Duty Kits have been designed to replace a Fully Assembled Spiral stair when access is an issue. In an upper end application, such as a high rise condominium, this staircase can be transported in an elevator, and when assembled, not look like a kit. Available in steel, aluminum and stainless steel. All parts on this spiral stair unit are machined and not stamped. Please Note: Galvanization and Wood treads and handrails are available options on any of the above listed spiral staircases. All Wood Spiral - Our final spiral stair type is All Wood. Our all wood spiral stairs are beautiful and available in any diameter and height. Our standard wood species is Red Oak but, it is also available in White Oak, Ash, Maple, Walnut, Cherry or Brazilian Cherry, Ipe, Teak, Hickory, Pecan. This staircase is assembled in our plant then disassembled to ship.